After two days of steady rain at Volusia Speedway in Florida, the Big Block Modifieds finally hit the track last night for their first night of racing. 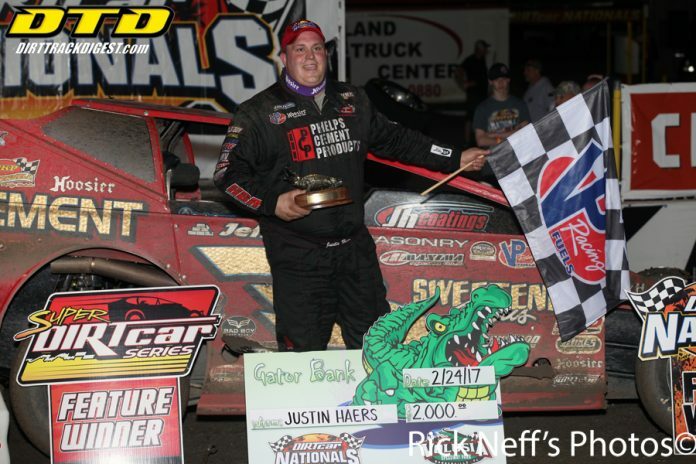 It was worth the wait, as Bicknell Racing Products customers had a great night and took home what everyone goes there to get, the gator! The track was fast all night, from the hot laps session it was easy to see that fans and drivers were in for one exciting night of racing. Jimmy Horton was fast out of the gate and was proving to be the one to beat. Bicknell Racing Products customers would pick up 3 of the 4 heat wins on the quick half mile track. Jimmy Horton, Alan Johnson would transfer from heat 1, Mario Clair who started on the outside pole in heat number 2 would finish second to transfer to the redraw, Rick Laubach and Tim Fuller would capture heat 3 and Justin Haers would win his heat from the outside pole to transfer to the redraw. An off night as Larry Wight and Matt Sheppard would both be relegated to the consi. Both picking up wins though in their respective races to get themselves into the 30 lap A main event later in the evening. As the sunset over Volusia, the stands packed with fans from all over the United States and Canada, the Big Blocks hit the track, saluted the fans with a four wide appreciation lap, and then it was time to let them loose. Mario Clair and Alan Johnson made up the front row. The green flag dropped and it was a short lived stint as Brandon Walters would come to a halt by pit road with a Left front flat on lap 1. The first half of the race would be littered with cautions as lap 5 Darwin Green would hit the wall hard. Heavy damage to the back right of the car would end Darwin’s night and possibly the weekend. Lap 8 Mike Bowman would slow in turn four but would refire to join the tail end of the field, finishing out the night with a top 10 finish. Lap 10 Joseph Watson would spin and hit the wall in turn one, lap 17 Brandon Walters would spin on the backstretch, lap 18 Larry Wight had a right rear flat and Rick Laubach would pull into the infield as he ran out of tear-offs and was unable to finish the race. After cautions were over the track was hard on equipment as it was the front runners who faded off with problems. Mario Clair who had battled up front, holding off Jimmy Horton, Alan Johnson and Justin Haers for the majority of the race, would end his night on lap 21 with a broken shock tower. Then it was Jimmy Horton, leading with five laps to go, would break an oil line ending his chance to pick up the win. He would bring out the caution as he fell off the pace on lap 27. With 3 laps to go under caution it was now Justin Hears sitting as the leader, but he would have to hold off Matt Sheppard who had slowly and quietly crept his way through the field. The restart with three to go would see Haers take the outside line, Sheppard on the inside. The green would drop and Haers would get back on the gas pulling away from Sheppard. The white flag fell over the speedway and it was all the Phelps Cement number 3 in cruise on control for the last lap to bring it home for the checkers and the coveted gator. Bicknell Racing Products customers would pick up 4 spots in the top 5 with Haers, Sheppard, White and Rudolph. Bicknell Racing Products would like to extend a congratulations to all drivers who competed last night. It was a great representation of why they continue to be number 1. Bring on night number 2!